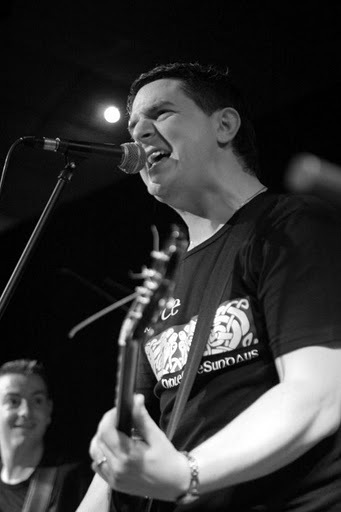 I spoke to Ronan MacManus, leader of the London-Irish rock band Biblecode Sundays. This was hands-down one of the more energetic live bands I had seen in many moons when I took in their show at Rocky Sullivan’s. They came on strong in the pub and summer festival here a few years back, but they haven’t been to our shores in a while. That doesn’t mean they’ve been idle. Ronan released a solo album, Strawberry Hill, and guitarist Andy Nolan has released a critically acclaimed film called Clan London. Film and music intersect these last few weeks on this side of the Atlantic as the Biblecode Sundays undertake a short U.S. tour to support their new EP, The Pittsburgh Kid, out now through iTunes. They will play a string of dates (May 27, 28 and 29) in East Durham on Memorial Day weekend at the Blackthorne Resort in East Durham, with Black 47, Derek Warfield, the Whole Shabang, the Gobshites and more. If that wasn’t enough, MacManus is thrilled to share the stage professionally for the first time with his brother Declan. Most of us know him by his famous stage name -- Elvis Costello. The pair recently played in Boston and New York. MacManus hints at more music and shows coming up. He describes the new music the band is recording as a bit of a departure from the London Irish sound they perfected. If you’re lucky, they’ll play some in East Durham this weekend! For more information on the band, log onto www.biblecodesundays.co.uk.